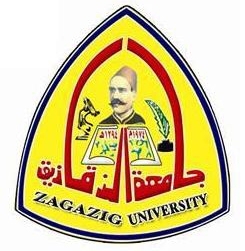 The Bruce Hammock lab, UC Davis Department of Entomology and Nematology, in collaboration with colleagues at the University of Zagazig, Egypt, will receive a three-year $190,000 grant to screen for pesticide contamination in foods in Egypt. Research begins March 1. The grant, “Food Quality in Egypt: Screening for Contamination with Pesticides using Innovative VHH Antibody-Based Assays and Biosensors,” was one of 15 collaborative projects selected for funding by the U.S.-Egypt Science and Technology Joint Board. 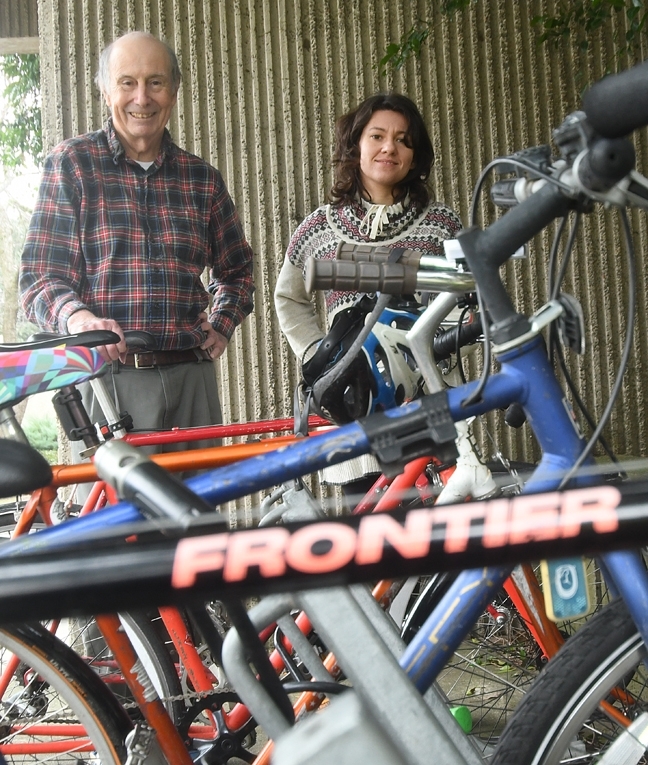 The grants foster research collaboration between Egyptian and U.S. scientists. The grants are funded by the National Academies of Sciences, and the Egyptian Science and Technology Development Fund. Reviewers evaluated the proposals' scientific and technical merit, relevance to program objectives, capabilities of partner institutions and individuals, nature of collaboration, and cost-effectiveness. The board funded less than 12 percent of the eligible proposals. “Immunoassay (ELISA) is an alternative and complimentary analytical method to instrumental techniques like liquid or gas chromatography,” said Vasylieva, who leads the immunoassay group in the Hammock lab. A native of the Ukraine, she received her master's degree from Taras Shevchenko National University of Kyiv, Ukraine, and her doctorate from National Institute of Applied Sciences in France. 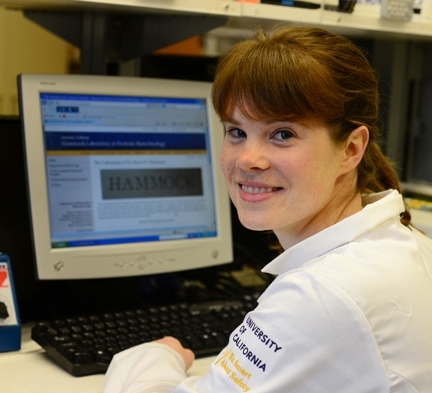 Joining the Hammock lab in May 2013, she focuses her research on development of nanobodies as neutralizing agents for small molecule poisoning, as well as use of nanobodies as therapeutics. To develop tools for fast and low-cost food contamination screening in the environment with minimal technical support. Hammock, a member of the National Academy of Sciences and the National Academy of Inventors, directs two major UC Davis programs; the Superfund Program financed by the National Institute of Environmental Health's National Institute of Environmental Health Sciences (NIH-NIEHS); and the NIH Biotechnology Training Program. Hammock, who holds a doctorate in entomology/toxicology from UC Berkeley, served as a public health medical officer at the U.S. Army Academy of Health Science in San Antonio, Texas; a postdoctorate fellow in entomology/toxicology at UC Berkeley; and a postdoctoral fellow in biochemistry with the Rockefeller Foundation, Northwestern University, Evanston, Ill., before joining the UC Davis faculty in 1980. 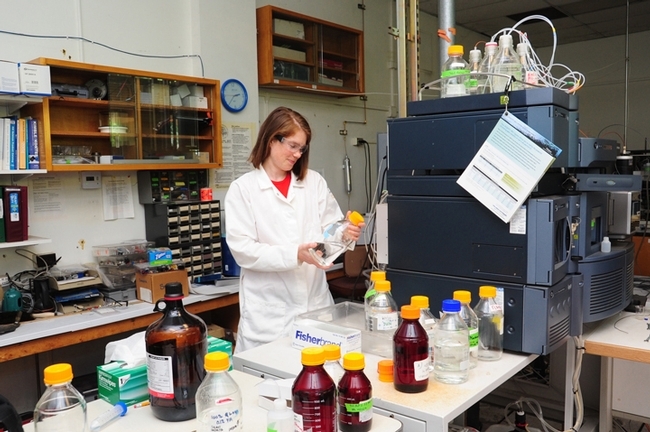 UC Davis chemist Amelia “Amy” Ann Rand talks about omega-6 fatty acids as enthusiastically and passionately as nutritionists talk about salmon, broccoli and spinach. Science intrigues her, fulfills her, and propels her. Rand, who holds a bachelor of science degree in chemistry from Mount Allison University, Canada and a doctorate in environmental chemistry at the University of Toronto, joined the Hammock lab in 2013 and was named a fellow on the Oncogenic Signals and Chromosome Biology T32 Training Grant, Department of Microbiology and Molecular Genetics. How does Amy Rand explain to the average layperson what she does? 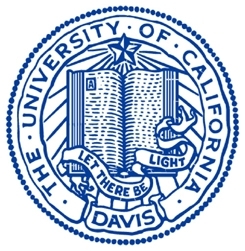 "Amy took on one of the most demanding projects in the laboratory in asking how a group of natural compounds regulate angiogenesis," said Hammock, a distinguished professor of entomology who holds a joint appointment with the UC Davis Department of Entomology and the UC Davis Comprehensive Cancer Center. 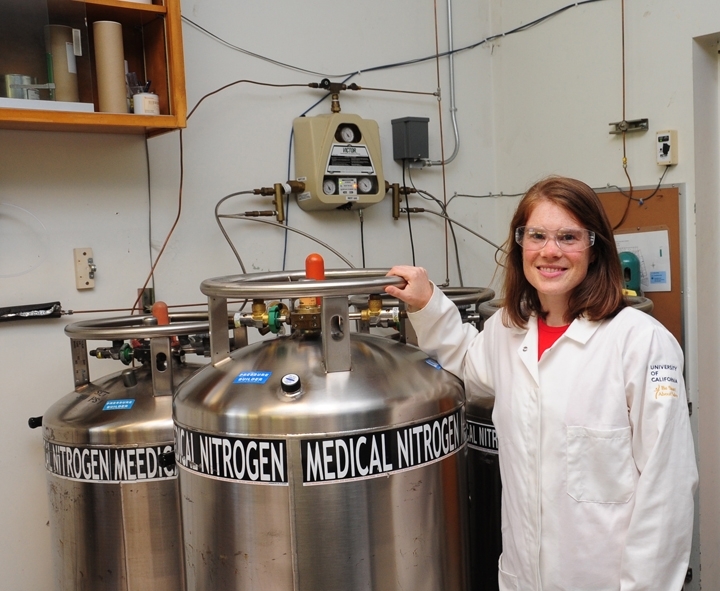 Cancer researchers praised her for her potential as a future leader in the field of angiogenesis research. 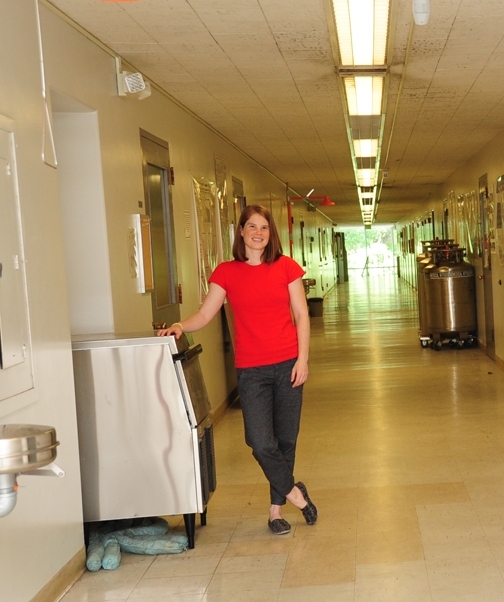 “We're so proud of her,” said Hammock, who directs the campuswide Superfund Research Program, National Institutes of Health Biotechnology Training Program, and the National Institute of Environmental Health Sciences (NIEHS) Combined Analytical Laboratory. Hammock and Rand collaborate with Harvard Medical School professor Dipak Panigrahy, former researcher in the Hammock lab and a fellow in the late Professor Judah Folkman's angiogenesis research lab. Folkman, the father of angiogenesis research, is best known for pioneering the concept of blocking angiogenesis or the development of blood vessels, to control cancer growth. "This concept has resulted in a number of anti-cancer drugs and has had a major impact on cancer treatment,” Hammock said. “Of course blood vessel development is also critical for survival." As for where science leads, Rand has just accepted a position as assistant professor of organic toxicology in the chemistry department, Carleton University in Ontario. She starts her position Sept. 1. "I hope we collaborate for the next 80 years or so," he quipped. DAVIS--Newly published UC Davis research characterizing specific mechanisms involved in blocking angiogenesis, or the formation new blood vessels, has the potential to block cancer growth and target other diseases, researchers said today. Earlier research by the Judah Folkman laboratory of Harvard Medical School showed that cutting off blood vessels that feed a cancerous tumor can stop its growth. The research, published April 10 in the Proceedings of the Natural Academy of Sciences (PNAS), explains, in part, why inhibiting the soluble epoxide hydrolase (sEH) in some systems is angiogenic whereas combining sEH inhibition with the inhibition of cyclooxygenase (COX) enzymes is dramatically antiangiogenic, which in turn may suppress tumor growth. Holds long term hope for cancer patients and those afflicted with heart, eye and other diseases. 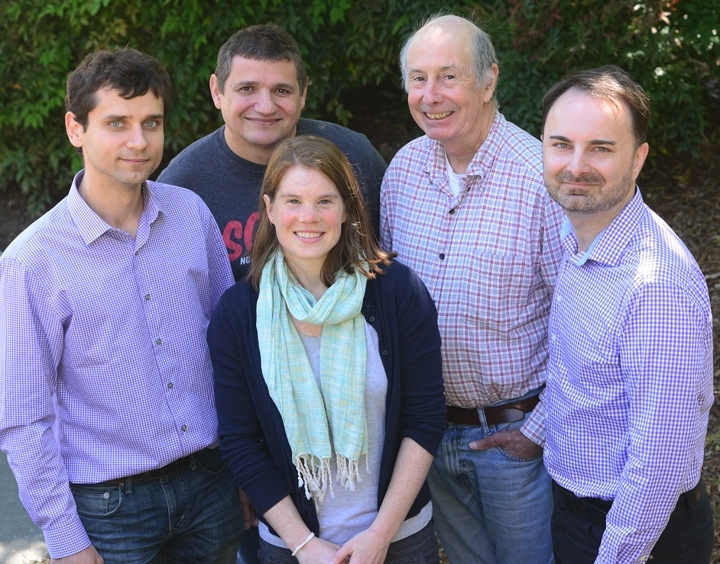 The team also included Christophe Morisseau, Bogdan Barnych, and Kin Sing Stephen Lee all of the UC Davis Department of Entomology and Nematology and UC Davis Comprehensive Cancer Center; Tomas Cajka of the UC Davis Genome Center; and Dipak Panigraphy of Harvard Medical School. Lee is now an assistant professor at Michigan State University. “Pro and anti-angiogenic therapy can potentially help millions of people worldwide in various diseases such as heart, ulcers, eye and cancer as first demonstrated by Dr. Judah Folkman and his colleagues,” said Panigraphy, formerly of the Hammock lab and now with the Center for Vascular Biology Research, Beth Israel Deaconess Medical Center, Harvard Medical School, and the school's Department of Pathology. Rand last year received the $100,000 Judah Folkman Fellowship for Angiogenesis Research from the American Association for Cancer Research. She won the highly competitive international award for her proposal, “Regulation of Cancer Angiogenesis from the Metabolism of Epoxy Omega-6 Fats.” Rand joined Hammock's biological analytical chemistry lab in 2013 and was a fellow on the Oncogenic Signals and Chromosome Biology T32 Training Grant, UC Davis Department of Microbiology and Molecular Genetics. The late Judah Folkman (1933-2008), a Harvard Medical School professor considered the father of angiogenesis research, “is best known for pioneering the concept of blocking angiogenesis (the development of blood vessels) to control cancer growth," Hammock said. "This concept has resulted in a number of anti-cancer drugs and has had a major impact on cancer treatment. Of course, blood vessel development is also critical for survival." Folkman discovered that cutting off the blood vessels that feed the tumor can stop cancer tumor growth. His revolutionary work has led to the discovery of a number of therapies based on inhibiting or stimulating neovascularization. Inhibitors of the sEH pathway are moving toward human trials to control neuropathic pain, but if combined with nonsteroidal anti-inflammatory drugs can block tumor growth by blocking angiogenesis. So Dr. Sung Hee Hwang combined inhibitors of both pathways into one molecule which is being investigated in cancer models at the UC Davis Cancer Center by Dr. Paul Henderson and Northwestern University Medical School by Dr. Guang-yu Yang. 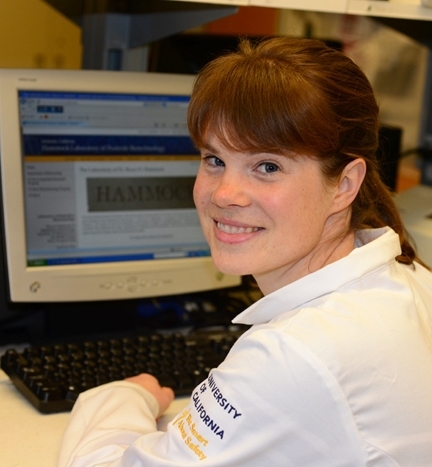 Hammock directs the campuswide Superfund Research Program, National Institutes of Health Biotechnology Training Program, and the National Institute of Environmental Health Sciences (NIEHS) Combined Analytical Laboratory. This work was supported by NIEHS and the NIEHS Superfund Program; and two of Rand's grants: the Oncogenic Signals and Chromosome Biology T32 Training Grant, NIH/NIEHS; and her 2016 AACR Judah Folkman Fellowship for Angiogenesis Research. Hammock Lab: Paper of the Month! DAVIS--A research paper on an innovative tool to control depression—the work of UC Davis distinguished professor Bruce Hammock and colleagues—has been selected a “Paper of the Month” by the National Institute of Environmental Health Sciences (NIEHS) in its online newsletter, Environmental Factor. The researchers found that a chemical inhibitor of a soluble epoxide hydrolase may be a new, innovative tool to control depression, a severe and chronic psychiatric disease that affects 350 million persons worldwide. Soluble epoxide hydrolase, or sEH, is emerging as a therapeutic target that acts on a number of inflammatory or inflammation-linked diseases, said NIEHS grantee Bruce Hammock, who holds a joint appointment in the UC Davis Department of Entomology and Nematology, and the UC Davis Comprehensive Cancer Center. Researchers from Hammock's laboratory collaborated with depression expert Kenji Hashimoto and colleagues at the Chiba University Center for Forensic Mental Health, Japan. The scientists observed mice for depression-like behavior after repeated social stress. NIEHS singled out the depression research as one of its four top papers of the month. 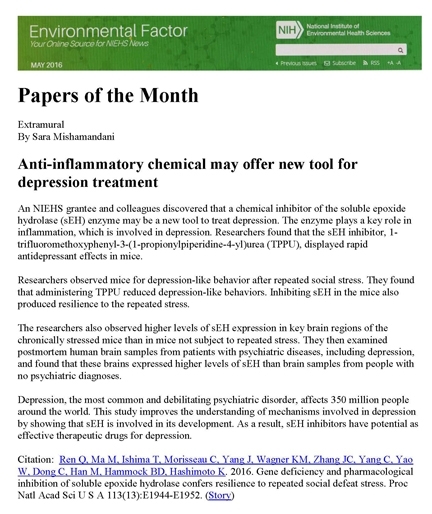 It headlined the work “Anti-Inflammatory Chemical May Offer New Tool for Depression Treatment,” in its May newsletter. “The researchers also observed higher levels of sEH expression in key brain regions of the chronically stressed mice than in mice not subject to repeated stress,” NIEHS wrote. “They then examined postmortem human brain samples from patients with psychiatric diseases, including depression. The work, published March 14 in the journal Proceedings of the National Academy of Sciences, drew international attention. Other authors on the paper are Christophe Morisseau, Karen Wagner and Jun Yang, UC Davis; and Qian Ren, Min Ma, Tamaki Ishima, Ji-chun Zhang, Chun Yang, Wei Yao, Chao Dong, and Mei Han, Chiba University.